Down the banks of the Yarra, past the Polly Woodside, a whole new neighbourhood is emerging. Forget the windy, desolate landscapes of Docklands: this north-facing area is full of sunshine and sheltered from the chillier southerly winds. Unless you are headed to the Convention and Exhibition Centre, shopping at South Wharf DFO or staying for the weekend at the Hilton, you’ve probably not had reason to head down here, but it’s worth the wander. Cross the street from the casino to Jeff’s Shed and keep walking. In the early evening in winter, the sun sets and the lights start twinkling, making all of the bars and restaurants look even more inviting. A quick drink before an event at the Plenary saw us trying out a platter of cured meats and a glass of wine at Plus 5, a small tapas bar and pizzeria close to the entrance to the Hilton. The generous $22.50 platter was more than enough to share, and the pizzas emerging from the wood-fired oven looked appetising enough. Later on, we nabbed one of the last tables at the spacious Bang Pop just a few doors down. Lego-inspired decor surrounded large share tables and a handful of smaller tables for two, with a decent-sized outdoor dining area lined with colourful bicycles. The menu was fairly standard Thai fare, and the service friendly but a little ragged (well, it was late on a busy Friday night I suppose). The chicken green curry was huge and well spiced, but the beef jungle curry was even bigger and had serious kick. We were relieved they had run out of the fish cakes we had tried to order as a starter – just two main courses with some rice was more than enough food. I’m not sure it’s the kind of place for a lingering dinner à deux, but it’s a lively spot with pretty great food. 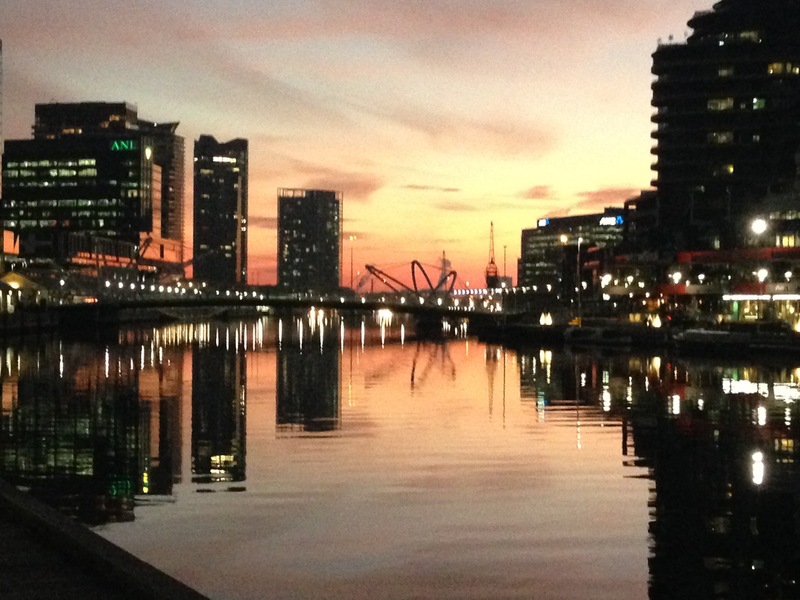 I reckon it would be a perfect spot in summer with a great view over the Docklands skyline. Don’t be put off by the walk. It’s literally five minutes’ stroll from the casino precinct, and a nice destination on a fine winter’s day or even a weekday evening.